Author(s): Mehlika Dilek Altıntop, Ahmet Özdemir, Anadolu University, Faculty of Pharmacy, Department of Pharmaceutical Chemistry, 26470 Eskiehir, Turkey. Özlem Atlı, Zerrin Cantürk, Merve Baysal, Zafer Asım Kaplancıklı. In an effort to develop potent antimicrobial agents, new thiazolyl hydrazone derivatives were synthesized and investigated for their inhibitory effects on pathogenic bacteria and yeasts. MTT assay was carried out to determine the cytotoxic effects of the compounds on NIH/3T3 mouse embryonic fibroblast cell line. 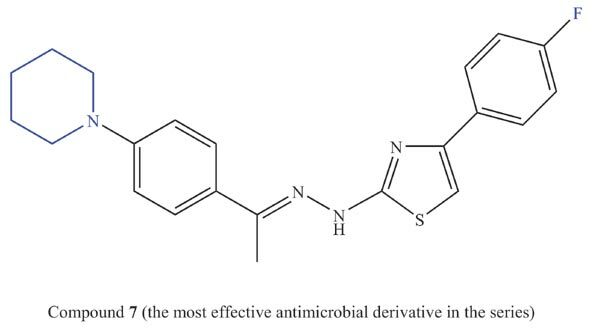 Among these compounds, 2-[2-[1-(4-(piperidin-1-yl)phenyl)ethylidene] hydrazinyl]-4-(4-fluorophenyl)thiazole (7) exhibited notable antimicrobial activity against Enterococcus faecalis (ATCC 51922), Pseudomonas aeruginosa, Escherichia coli (ATCC 35218), Candida krusei, Candida glabrata and Candida parapsilosis. Due to its promising antimicrobial activity, the mutagenic potential of compound 7 was also evaluated by means of Ames test. According to MTT and AMES assays, this compound was identified as non-toxic and non-mutagenic. Keywords: Thiazole, hydrazone, piperidine, antimicrobial activity, cytotoxicity, genotoxicity. Affiliation:Anadolu University, Faculty of Pharmacy, Department of Pharmaceutical Chemistry, 26470 Eskiehir, Turkey. Keywords:Thiazole, hydrazone, piperidine, antimicrobial activity, cytotoxicity, genotoxicity. Abstract:In an effort to develop potent antimicrobial agents, new thiazolyl hydrazone derivatives were synthesized and investigated for their inhibitory effects on pathogenic bacteria and yeasts. MTT assay was carried out to determine the cytotoxic effects of the compounds on NIH/3T3 mouse embryonic fibroblast cell line. Among these compounds, 2-[2-[1-(4-(piperidin-1-yl)phenyl)ethylidene] hydrazinyl]-4-(4-fluorophenyl)thiazole (7) exhibited notable antimicrobial activity against Enterococcus faecalis (ATCC 51922), Pseudomonas aeruginosa, Escherichia coli (ATCC 35218), Candida krusei, Candida glabrata and Candida parapsilosis. Due to its promising antimicrobial activity, the mutagenic potential of compound 7 was also evaluated by means of Ames test. According to MTT and AMES assays, this compound was identified as non-toxic and non-mutagenic.